Figure 3: (A) Schematic of the SSAW-based sorter excited by FIDTs. (B) The concentric geometry of the FIDTs. θ is the degree of arcs and R is the radius of innermost transducer. O is the focal point and the two sets of FIDTs is O-axis symmetric. (C) An optical image of our high throughput SSAW sorter. 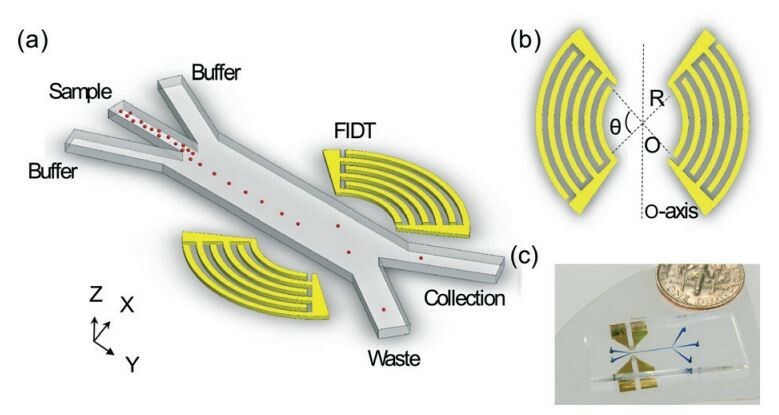 Acoustic-based fluorescence activated cell sorters (AFACS) have drawn increased attention in recent years due to their versatility, high biocompatibility, high controllability, and simple design. We developed a high-throughput AFACS method based on standing surface acoustic waves (SSAWs) (Fig. 3). We utilized a pair of focused interdigital transducers (FIDTs) to generate SSAW with high resolution and high energy efficiency. We demonstrated a minimum actuation time of 72 μs, which translates to a potential sorting rate of more than 13,800 events per second.